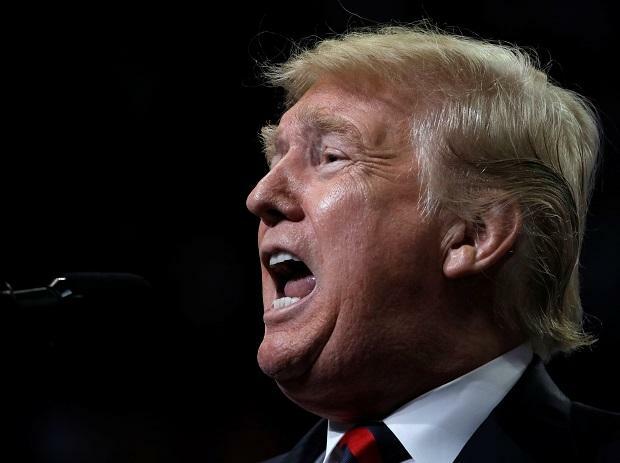 President Donald Trump on Monday defended his decision to give temporary exemptions to eight countries, including India and China, from the ban on Iranian oil imports, saying it was done so to keep global oil prices down and avoid causing a shock to the market. "We have the toughest sanctions ever imposed. But on oil, we want to go a little bit slow because I don't want to drive the oil prices in the world up," Trump told reporters at Joint Base Andrews outside Washington on Monday before leaving on a campaign trail for the mid-term polls. When asked about his decision to give temporary exemptions to eight countries from the ban on Iranian oil imports, Trump said, "I'm not looking to be a great hero and bring it down to zero immediately. I could get the Iran oil down to zero immediately, but it would cause a shock to the market. I don't want to lift oil prices." "If you notice, oil prices are going down very substantially, despite the fact that already half of their capacity is gone. But I don't want to do that," he said. "I saw some people saying, 'Oh, why aren't you tougher on that?' Well, the sanctions are very tough and I don't want to lift the oil prices worldwide by clamping down 100 per cent. It will be gradual," the US president said. However, the Democratic Party leadership criticized Trump for giving exemptions to some of the major Iranian oil importers. House Democratic Whip Steny H Hoyer said, "Rather than achieving its stated goal of eliminating Iran's oil exports altogether, the administration has issued 'exemptions' for major Iranian oil importers, allowing Iran to earn billions of dollars from oil sale." "These exemptions are premised on significant reductions of Iranian oil imports by countries such as China and Turkey when there is minimal evidence of such reductions. This waters down the integrity of sanctions and communicates to the rest of the world that others do not have to abide by the US restrictions," he said. Hoyer alleged that by "tearing" up the Joint Comprehensive Plan of Action (JCPOA), the Trump administration has isolated the United States and undermined the multilateral efforts to curb Iran's "dangerous" behaviour. Congressman Adam Schiff, the ranking member of the House Intelligence Committee, said by reinstating sanctions without justification, Trump is pitting the US gainst European allies and increasing its reliance on Saudi Arabia at a time when that country is "implicated in a plot to assassinate" on foreign soil a journalist and its outspoken critic. "The downside risks to this policy are manifold it could cause Iran to restart its nuclear enrichment efforts, bringing us closer to a military confrontation," he said. Schiff said, "The Trump administration's unilateral re-imposition of these sanctions will also accelerate efforts to facilitate transactions through alternative financial channels that are not reachable by the US sanctions and into which we will have limited visibility." US National Security Advisor John Bolton claimed that the 2015 nuclear deal with Iran failed to "permanently block all paths to an Iranian nuclear bomb". "Further, its negotiators failed to secure any restrictions on Iran's other destabilizing activities, including the regime's ballistic missile development and proliferation," he told a New York audience. Democratic Senator Tom Udall, who is also a member of the Senate Foreign Relations Committee, said, "Led by people like John Bolton, who believe that we should bomb Iran, I fear the Trump administration is marching toward another catastrophic war in the Middle East." "This administration's reckless withdrawal from the JCPOA has squandered our best opportunity to prevent a nuclear Iran, moving us closer to a military conflict that the American people don't want all while undercutting our most importance alliances abroad," he said. But Senator Bob Corker, the chairman of the Senate Foreign Relations Committee, said the Trump administration deserves credit for re-imposing sanctions and dramatically reducing Iran's oil exports and revenues. In May, President Trump had pulled the US out of the 2015 landmark JCPOA terming it as disastrous". Under the Obama-era deal, involving five permanent members of the UN Security Council and Germany, Iran had agreed to stop its nuclear programme in exchange for relief from economic sanctions. After the US' withdrawal from the deal, Trump signed fresh sanctions against Iran, which claims its nuclear programme is peaceful and for civilian purpose.